Stream of thought and history for my attempt at doing industry in Eve online. Is it still a hiatus if it's forever? And with this, I say adieu. I am taking another hiatus from MMO's. The final nail in the coffin was Borderlands 2 GOTY edition. I plan to leave the comunity in good standing with my accounts, characters, and assets intact. No you may not have my stuff. I leave with ~7B isk in total, ~3B liquid, and the rest in ships, manufacturing assets, and various other assets. Not bad, not great, but not bad. I started my experiment having a hard time scraping together the 500M isk manufacturing entry capital. I don't have the numbers, but since I had to sell all of my ships except for the 1 battleship and a couple of mining ships and industrials I kept around to come up with 500M isk, I would say that I had less than 1B in assets. As for anyone reading this, I bid you adieu, as both my accounts expire this week. I may be back sometime in the future. Lockefox is still trying to subvert my will by talking about Prosper at lunch :) And eventually he may succeed, but today is not that day. In the beginning of this blog, I stated that I was going to do this hard mode. NPC stations in high sec and no real outside help. Well that was a fun exercise. Next? Just a note: I have been up for greater than 24 hours at this point, so the stream of thought is tending to sputter more than it should. I went ahead and dropped a POS in a quiet 0.5 system last week. I got it all setup and moved most of my production there. It's more expensive to have Red Frog ship out to me now, and I still have to cover an additional 2 jumps to get it into my POS. I need to train a character into an Orca to make these last couple of jumps in as few trips as possible. I still have a couple of copy jobs etc. hanging around my old home. So now I have all this possibility. I am training up a component builder/BPO researcher for my own library and to support my invention toons. This takes advantage of the ME/PE research slots I get for free, and allows me to increase profit margins without reducing ISK/hr of my inventors. I have thought about a lot. I thought about buying all the parts that I would need to start building Orcas. But with an initial buy-in of 10-12 billion and profit under 10% for a very well researched BPO, it just didn't seem worth while to me. All of these possibilities have left me needing better tools. I find myself spending more time writing tools than playing most nights anymore. I also need to find more time to spend in Faction Warfare with my main. Until I have a steady income with minimal work, I am not seeing a lot of time for it though. While the main focus of this blog is not on my tools, they are part of my decision making process. I have chosen to write these tools in Java for several reasons. Java is "natively" a cross-platform language. I work as a sometimes programmer, and was looking to write a cross-platform data extraction/analysis tool. I wanted a language with better libraries than Perl or C/C++. Perl libraries tend to be a little more unpolished and hap hazard. C/C++ support for things like XML and JSON, in the freeware department, Are lacking or non existent. Yes I will take flack for this, but after working on a project and compiling all the libraries using mingw through a cygwin terminal (for unix like commands needed by the make files) and realizing that cygwin adds a dll dependancy to your executables. Free tools, like Window Builder. I started with a simple tool to do invention calculations and spit out shopping lists, has turned into an interlocked toolkit, that just keeps growing. This was my initial tool idea, but a lot more complex. Lots of options here, but when you boil them all down, the only tool currently with a GUI is my shopping list editor. Lots of options to dial in manufacturing and invention costs. Has some functions to make historical and other graphs. One of the issues using this tool is that the database holding its blueprint information only holds the current SDE release, so you can not automatically see the cost of change of materials. Command line tool to generate statistical information for T1 manufacturing over a period of time. Output is in the form of csv's with product name/date. Much like Profiteer, but adds in all the variations of the invention process. It cycles through all available decryptors and meta items for each T2 blueprint in the selected market group. I need to find some better ways of estimating true velocity. I tried entering the Large Remote Energy Transfer Array II market, and am still holding onto ~300-500 M stock in sales orders. On paper, this product looked very good, but the velocity is turning out to be very low. This is an attempt to pull kill data from zkillboard.com. All of the kill data, along with some related price information is stuffed into a giant database. From the database I plan to get item destroyed data to help with making market decisions. This is a tool that I have not yet started working on. I will need to finish killPuller enough to reliably extracts the large dataset for me before I can start working on this. This will be the second GUI tool. Should be able to search the kill data and find large battles. Should be able to create different battle reports. A per side isk lost over time graph, to give an idea how the battle progressed. I need to design a smart application to read in API data to find actual buy/sell prices on a unit by unit basis. Trace the material from purchase through industry jobs and finally into the sell orders. Categorize other purchases, both automagically and manually. I need to get busy :). Faction warfare, industrial warfare, and programming. Lots to do, lets see if I can find the time to do much of this. Spent ~1.3 B isk on faction standings to be able to drop a tower. Spent close to 1 B isk on a tower and fuel. Overall value down a few billion due to spending. Looking into alternate products to produce. Had some issues with previous products I have tried producing, leaving me with ~500 M isk on the market not selling. Without a 2 week lead time on copies, I can adjust to new products on the current cycle. 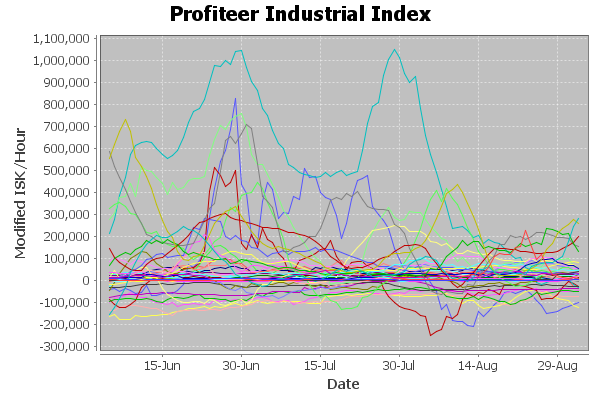 Still working on tools to find those more profitable products, or those with acceptable velocities. Thinking about putting up researched blueprint kits. Perfect ME / PE 15 T2 component packs sell for 80 - 100 M isk each. 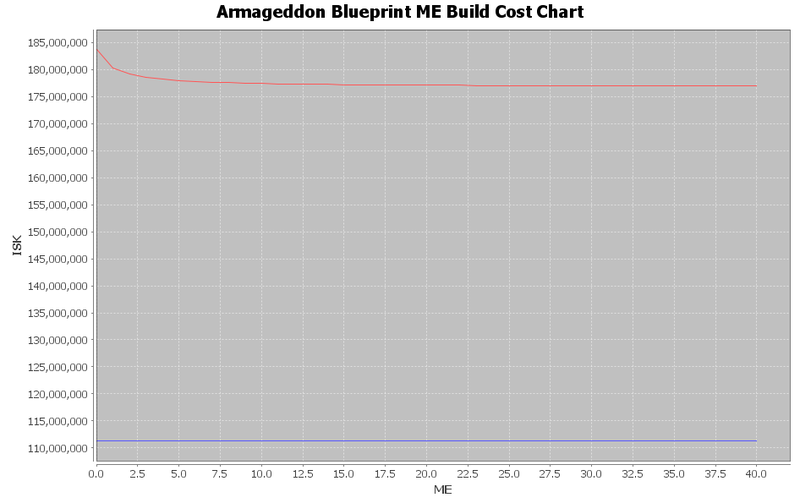 Blueprints cost ~45 M isk per type. for a profit of 35 - 55 M isk. This can be completed in a little over 48 hours for all 9 BPOs, but volume of contracts moving is going to be an issue. Finishing training on a component builder / blueprint researcher. Training my standings inventor into being able to solo L4 missions. This will allow me to bring up standings even further to allow dropping towers in .7 systems. Eventually I will need to work a standings repair plan to get this character to be able to drop a tower in any .7 system. All I can do is shake my head and move on when I see stuff like this: A Free Tax Cut Recruitment post. But looking at the market, and the profitability of certain products, especially T1, its obvious how hard people like the above corp are driving the market. Lets look at a specific example of this failure. 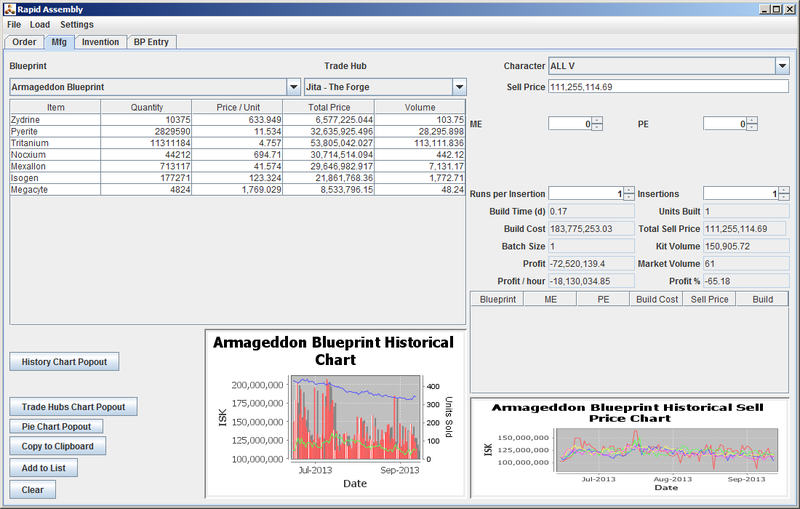 Armageddons are selling for 111M isk. Manufacturing cost is 183M isk. Looks like market volume is ~100 hulls/day. 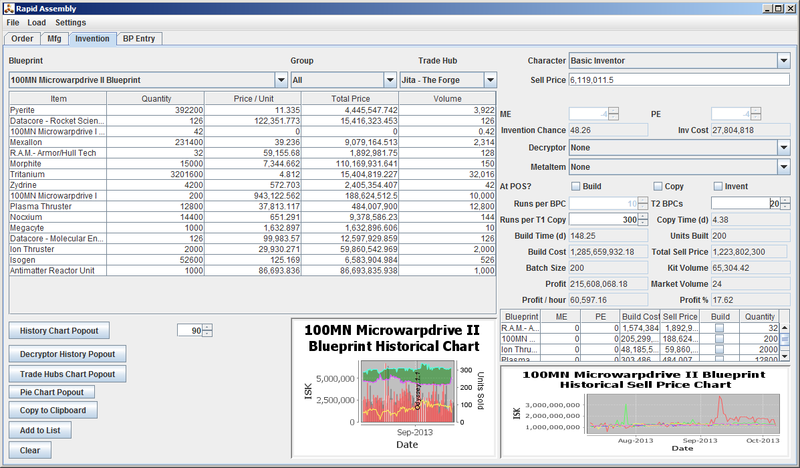 All prices/volumes are in Jita using ME 0, PE 0. That means that you are losing ~72M isk / hull. A single manufacturer can make ~6 hulls per day. 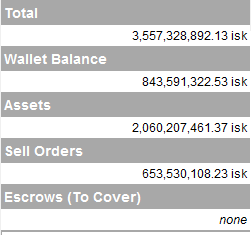 That is nearly half a billion isk/day lost, or ~18M isk/hr. Looking at the above ME chart, anything less than 178M is selling for a loss, and anything less than 228.75M (20% profit) is not very interesting to a manufacturer. This is the greatest failure to understand the market that is prevalent in Eve. And its not just a miner problem either. I have heard of logistics directors thinking that moon goo from their POS's that they but into T2 Ships are free. This is simply not true. There is no argument, it's just fact. Whether it's an opportunity cost or the cost of your time, it must all end up in the final equations. I was debugging Profiteer earlier today because I could not believe that battleships were losing this much money at the volumes they are moving at. 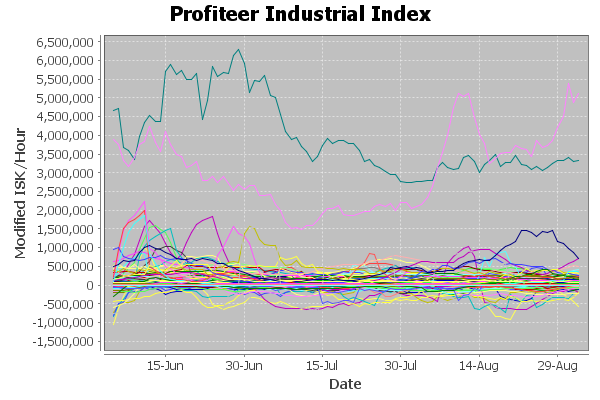 I will post the isk / hour lost on each of these hulls. The fact that so many people are losing so much money so quickly is absolutely mind boggling. There needs to be some kind of education program to keep people from failing as hard as they are. But, this is Eve, and space is harsh. I have been lucky to work with Lockefox and have some serious and deep discussions on the realities and maths involved with running a successful industry program. In a few short months, I was able to start making multiple billions in sales per month. I was lucky enough to have a mentor who could guide me past the pitfalls of Eve Industry. Another co-worker who mainly missions/rats in null expressed interest in Industry in Eve, and the advice that I gave him I would suggest for any aspiring Industrialist who does not have a mentor, Don't do it. There are a lot of ways to make money in Eve. High level industry is a form of PvP all its own. Just like market trading is a form of PvP. And while PvPers judge themselves by kill board stats and isk values, Industrialists do it with kit buy-ins and profit margins. I would like to see T1 industry be a viable thing, and in niche markets, those with higher skill requirements, or that use non-minable materials, there still is some good profit, sometimes exceeding what can be made in T2. One of the big problems with that is that you have to be agile in what you make as you can easily exceed demand with the amount you can produce. Nothing is free. If you don't have a mentor, don't do industry. Lockefox has a really good write up on starting a new inventor at Everything you never wanted to know: Industrial Alt. I am just expounding on this by linking the EVEMon training plan I made for a new character to train said plan. I add 4 common Science skills so that the training plan has them, change these as needed. All of my new alts follow this plan initially. So, I thought I would formalize it by making an EVEMon raining plan that I could import to a new character day 1. It also lets me get all the training books needed ready on contract before creating the character. The last couple of characters that I have made I have entered this by hand. Note: I would call Electronic Engineering a must since its a requirement to build components. Always check everything you plan on building for required skills before starting your training. This will hopefully become a regular thing. 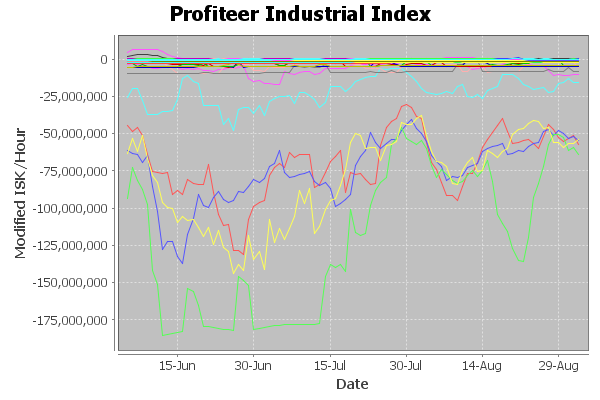 I now have the ability to check the profitability of products over varying time frames. 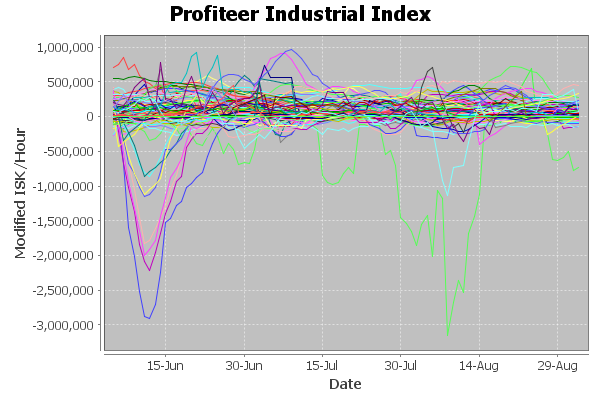 So I am hoping to run these 90 day extractions on a quarterly basis to see over all market health, based on Industrial Index. Below are the T1 results, based on market groups. Hopefully I will have similar results for T2 product soon. All charts were run with ME 0. At most, perfect me will get you a 10% margin. Add in the cost to sell items, 2.5% unskilled, and you shave that 10% margin down to 7.5%. That does not inspire me, so anything that is not profitable at ME 0, is just plain not worth my time, IMHO. Note, I am far from a market expert. As everything else in this in this blog, this is more for my reference, maybe hoping for a little community feedback. Looks like a lot of ways to lose a lot of money in T1 Ammo and charges. 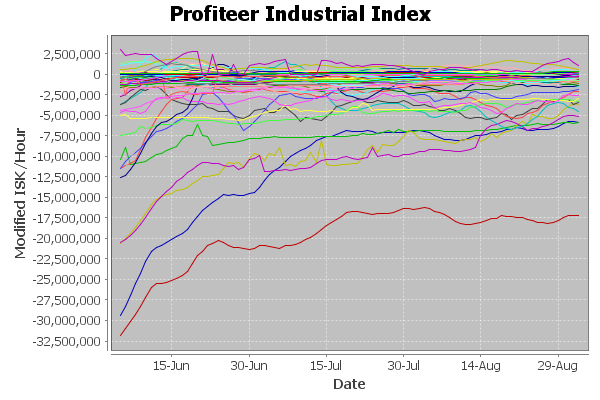 Looks like a lot of the worst products lost a lot of profitability, but recovered within a month or 2. 95% of profitable ammo falls under 100K isk/hr on the index. Market looks much healthier in the ships equipment market group. 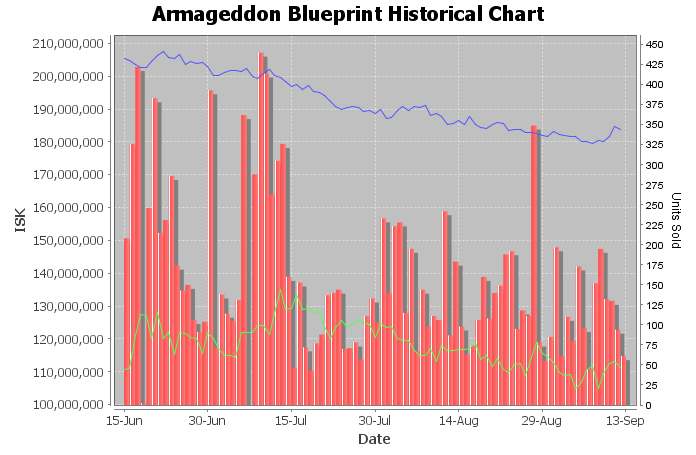 A few outliers driving the upper end of this chart are the new relic site only BP's. I have not found a good way to exclude these, so they are polluting the data set this time around. Fighters and Fighter Bombers have shown a huge flux, some going from the most profitable to unprofitable within a couple of months. Looks like most of the other products had no major shifts in profitability. Moon goo changes forcing component prices to go all over the place. Emergent Neurovisual Interface fell like a rock in August. T1 ships look like another market to lose a lot of money quickly. Battleship mineral changes have yet to make most of them profitable again. Please remember, these graphs were not meant to aid in product selection as much as look at manufacturing in market groups in general. I am also far from a market guru. Also, if an item had components that could be made, these numbers reflect buying them from the market. There are some interesting things to see from this data, showing just how much the T1 market was shaken, and how relatively untouched some markets were. Again, hopefully sometime this week I will be able to get some T2 numbers out. This is complicated by the use of decryptors and meta items that can drastically affect the profitability of T2 product. That means that I have to calculate 10-50 variations of every product. A couple of changes made this week drastically increased the speed of my Profiteer, and the Invention Profiteer should be able to take advantage of those same improvements. Going with a new format for the report. I just installed JEveAssets so I am using that now. 1.813 B in sales on 1.812 B in purchases. This includes PvP ship buying. See previous article for more information on what has been happening in the last 2 months. Next Inventor is coming up on skill training complete. My main is moving to do Medium T2 ammo. In station it's a 7-8 day manufacturing time / BPC, so that gives me plenty of time to invention and PvP. Starting copying jobs in NPC station for my new products. These were found using my new Invention Profiteer program. These should be strong sellers with good margins, all above 50%. Looking into dropping a POS. Running cost benefit evaluations on different sizes and configurations. Trying to run my standings up on 1 of my alts so that I can drop towers on my own, without standings services in the future. Saving money needed to drop towers. Fully anchored medium towers, with fuel, run around 1 B each. Although if I take Lockefox's advice and drop 2 medium towers with only a minimum number of labs each to allow future expansion, it will only come to ~1 B.
EVE Online and the EVE logo are the registered trademarks of CCP hf. All rights are reserved worldwide. All other trademarks are the property of their respective owners. EVE Online, the EVE logo, EVE and all associated logos and designs are the intellectual property of CCP hf. All artwork, screenshots, characters, vehicles, storylines, world facts or other recognizable features of the intellectual property relating to these trademarks are likewise the intellectual property of CCP hf. CCP hf. has granted permission to Valkrrs Eve Industrial Journal to use EVE Online and all associated logos and designs for promotional and information purposes on its website but does not endorse, and is not in any way affiliated with, Valkrrs Eve Industrial Journal. CCP is in no way responsible for the content on or functioning of this website, nor can it be liable for any damage arising from the use of this website.